So, today is the second day of Nurgle, and we have been graced with some more pictures of the new Great Unclean One model. There are 3 available variants for the model. The third is actually a new special character called Rotigus. 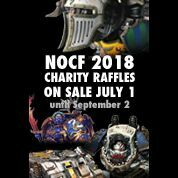 Last but not least, we now know that the first battletome for 2018 will be one for Nurgle called Maggotkin. I am assuming this will follow the same format as the Khorne and tzeentch.